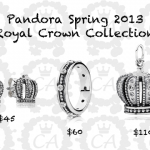 Rounding out the Pandora Spring 2013 previews, this post includes pictures and prices of the jewelry pieces that will be released for The Beauty of Spring and Celebrate Your Family’s Love. As I mentioned previously, the spring collection will be split into two release dates with the first part slotted for March 11th and the second for April 15th. 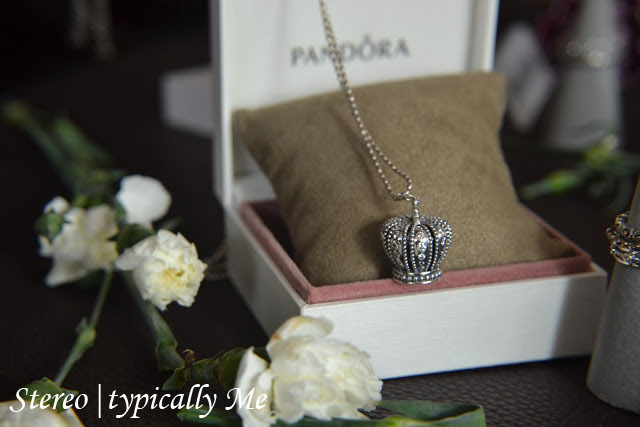 Most of the jewelry will make its debut with the first part of the release; the themes for the rings, earrings, and pendants are: Cherry Blossoms, Royal Crown, My Princess, and Coordinating jewelry. 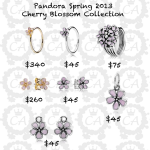 Cherry blossoms are a major part of this collection, between the silver charms, Murano, earrings, pendants, and rings, this motif is represented by 11 pieces. 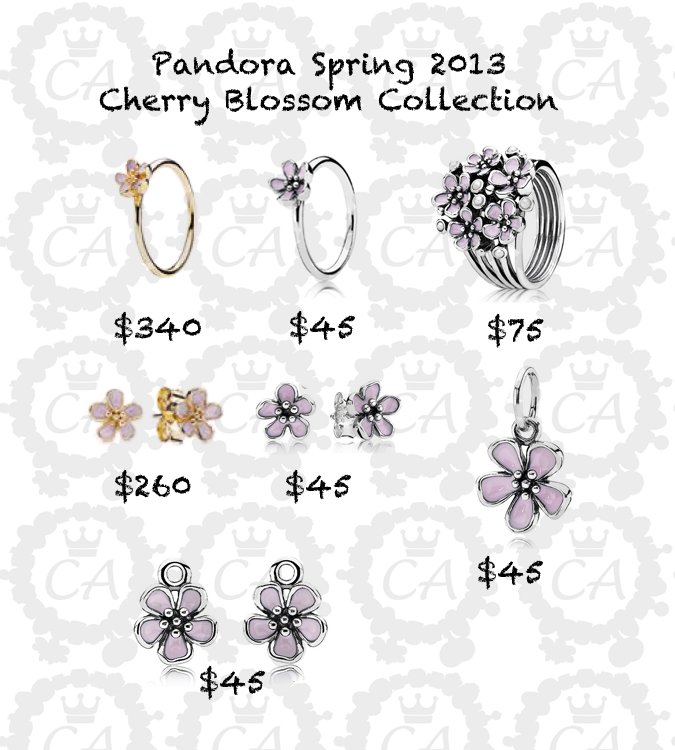 Generally, I love cherry blossoms, but haven’t been as keen to Pandora enamel charms so I hope the enamel clips will look elegant in person. 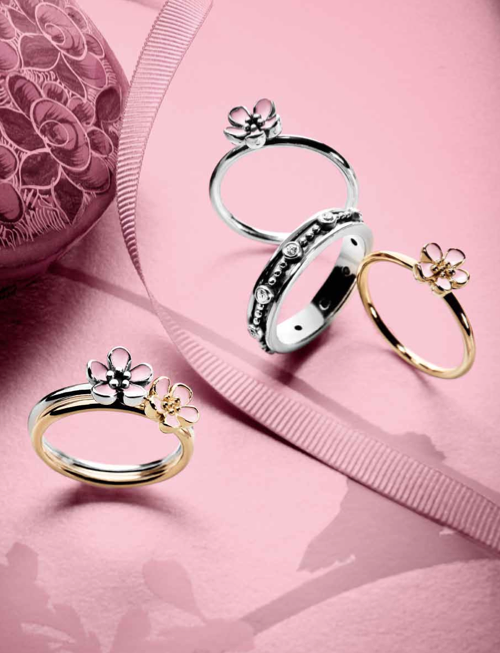 The cherry blossom Murano is one that I’m highly anticipating and I really like the cherry blossom bouquet ring as well. 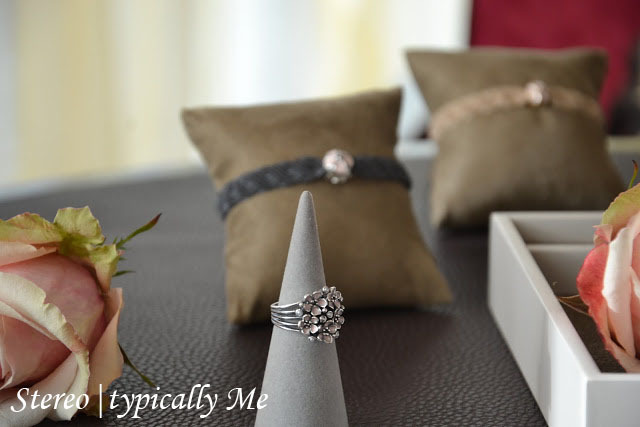 I always seem to gravitate towards large statement pieces so the bouquet ring is right up my alley, and the single blossom ring can be used to stack creating a custom look. To continue the fairy tale concept, the royal crown and my princess collections use regal headgear as centerpiece symbols. The popular crown which made its first appearance as a gold charm then as a highly oxidized openwork, will soon be available as a pendant, earrings, and ring. 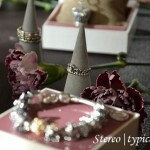 These pieces will include cubic zirconia details making them very glam! The large necklace pendant looks fantastic, and I think it’s going to look great on but the pendant and chain will be sold separately. I’m not sold on the princess tiaras, they seem to be targeted towards a younger demographic, but that’s just me. For Mother’s Day, only three jewelry pieces are set to debut: the Faith, Love & Charity pendant, the safety chain, and the charm barrel shaft. I’m very excited about the charm barrels since it’s the first time that Pandora has made a device for converting charms to earrings. Do note that these barrels are not designed for Muranos, only openwork charms including the pavé collection. The safety chain features a string of hearts similar to the two-tone safety chain, so while I’m glad to see another safety chain added to the line, I wish it was a different design. The Faith, Love & Charity is a bit too chunky for my taste. 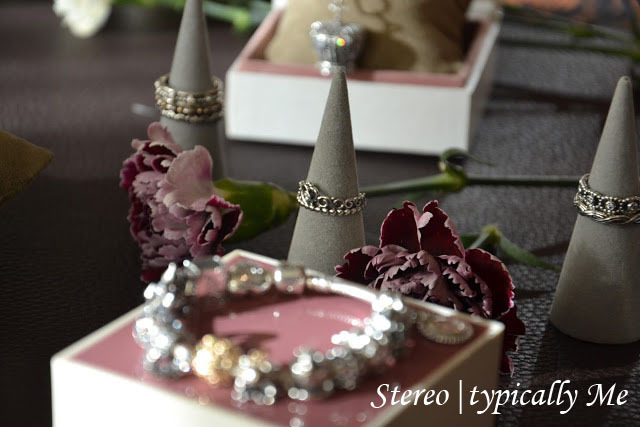 Thanks to Julia Lorber from Stereo|typically Me and Sonja Petrkowsky from Fashiontweed we have some wonderful pictures of the jewelry in real life. Are any of these pieces a must have for you? Me too, not enough safety chains! Yeah, and how about more clip style safety chains! I don’t understand why they don’t make more of those. I’d love to see more safety chains. I’m doing without for most of my bracelets since there’s not that many. To be honest I’m not super thrilled about spring. On the other hand, saving a ton of money for the summer release!! 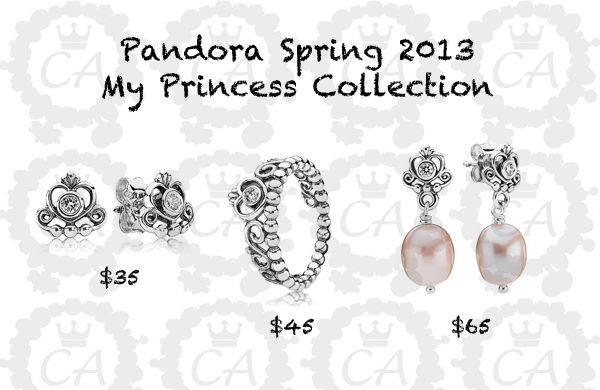 There’s a few I like, especially the two tone fairy tale charms ;). The spring/summer collection is a strange one for me. 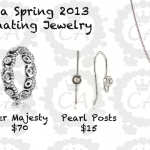 I’m not really thrilled by any of the charms, but I’m really drawn to crown pendant & earrings. I also like the tiara ring and stud earrings. 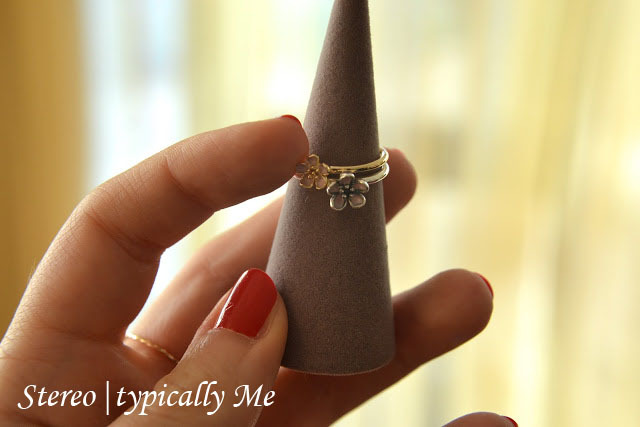 The ring reminds me of the the Irish claddagh ring, and the earrings are sweet and delicate. But I don’t like the matching charm at all, it’s way too juvenile with “my princess” engraved on it. 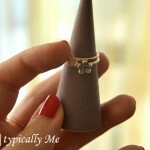 I agree and I thought the same about the ring! I love the crown pendant, I hope it’s as big as it looks :). I’ve seen the crown pendant and you won’t be disapointed. Yay! I’m so excited :D.
I think I must be easy to please because I like quite a few of the charms. I’m sure they’ll look better in person :). Do you know the length of the silver chain? I’ m so disappointed about the new pandora collections, especially the Pave charms didn’t thrill me at all and when I saw them in person I was even more disappointed. Last year I started collecting Trollbeads and Redbalifrog and I must say it’s so much more fun playing with these charms, especially the silver beads of RBF are so amazing. Yesterday I receved the “Joshua” and the “Klimt” bead from Heidis Trollbeads and I was so impressed of these charms (or how you say “over the moon”), the details are so amazing, love them. I can’t wait to see the new RBF charm collection. Happy Valentine’s Day to all charms addicts! The summer charms won’t be out for a while. Can’t wait for them! I love the animal charms, I think I have most of them – I’ve even got the sideways elephant so if I get this one, I’ll have 3 elephants! Hahaha. True, he is more “exotic” that’s a good word to describe the new one! and Leann, i’m the same way! i have a bracelet dedicated to my little animals lol and still want more! they are stinkin cute! I love the little animal charms, I’ve got a Pandora zoo theme and working on an aquarium bracelet too ;). I agree…and another kitty too? Hmmm. Not sure if you can answer this but I am hoping that the summer collection will have new travel charms. I love the paris Rome etc any idea if more are coming? There will be some travel charms for summer. More info to come! I can’t wait for this!!! I am hoping one day they release a china charm with the great wall or something! That would be great! I wholeheartedly agreed :). Have you heard anything regarding the supposed LE two-tone Teddy charm? I saw a photo of it on IG from @pandorasouthend… something I would definitely put on the list for the bf! Yes, Maya. It’s a Mother’s Day special. Oh, thanks! I must have passed over that blog post! 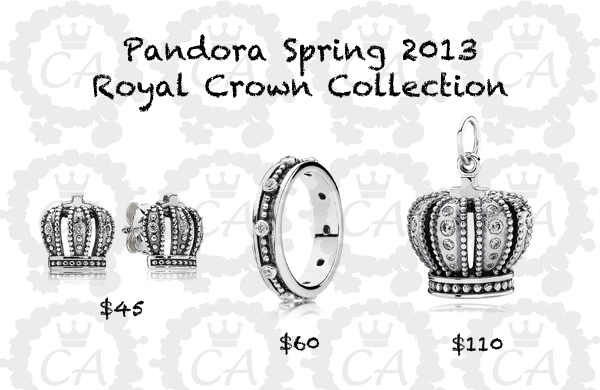 The crown pendant might be a tad big for a bracelet but it will certainly be a statement piece! 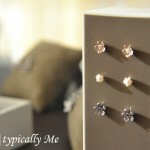 Hi Vanessa, the barrel earrings should be available with the Mother’s Day collection. So mid-April :). Thanks! But i went into a Pandora store today and the lady told me July……i definitely cant wait until then! Im so glad Pandora has made something to put charms on earrings. Oh yikes. I think Concept stores get new products first so maybe that explains the delay? The charm barrels only fit openworks charms though, not screw on :(.